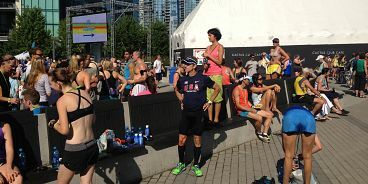 The worlds coolest half-marathon, lululemon’s SeaWheeze, is about to go down in Vancouver and if you’re one of the ten thousand participating runners, here are two meal ideas to fuel you up for the fun day. Instead of pasta the night before the race, how about a nutrient-rich sweet potato dish? These healthy spuds are packed with good-carbs, beta carotene and so much more, which you’ll be sure to appreciate at the half-way mark. Keep it simple by roasting them and enjoying on a bed of quinoa with a side of fish or tofu (it’s important to get a hit of protein the day before your run, too). On the morning of the big day, stick with something super simple like a nut butter on toast. My new favourite almond butter on the marker is by Monkey Butter who’s got two new flavours: Mocha and Vanilla Spice. The third annual lululemon SeaWheeze happens Saturday August 23rd. Good luck to all you runners!